Joshua Fields Millburn & Ryan Nicodemus, known to their 4 million readers as The Minimalists, are bestselling authors and international speakers who write and speak about living a meaningful life with less stuff. Their books include Essential: Essays by The Minimalists, Minimalism: Live a Meaningful Life, As a Decade Fades: A Novel, and Everything That Remains: A Memoir. They have been featured in the New York Times, Wall Street Journal, USA Today, Forbes, Boston Globe, San Francisco Chronicle, Chicago Tribune, Seattle Times, Toronto Star, Globe & Mail, Vancouver Sun, Village Voice, LA Weekly, and many other outlets. Visit the authors online at TheMinimalists.com. Carolyn Baker, Ph.D. is the author of Love In The Age Of Ecological Apocalypse: The Relationships We Need To Thrive (2015) and Collapsing Consciously: Transformative Truths For Turbulent Times (2013). Her previous books are Navigating The Coming Chaos: A Handbook For Inner Transition (2011) and Sacred Demise: Walking The Spiritual Path Of Industrial Civilization’s Collapse (2009). She lives and writes in Boulder, Colorado and manages her website www.carolynbaker.net. A former psychotherapist and professor of psychology and history, Carolyn offers life coaching for people who want to live more resiliently in the present as they prepare for the future. Read a recent review of Carolyn's Love In The Age Of Ecological Apocalypse: The Relationships We Need To Thrive in our blog. Nancy Deren opened her private practice in 2001 to assist clients in developing the confidence, practical skills, and understanding to deal with a broad range of day-to-day money matters, and to plan for life transitions. She received her certification as a Financial Recovery SM Counselor from the Financial Recovery SM Institute’s training program in December 2000. She completed a program in co-active coaching from The Coaches Training Institute in 2002, and received her AFC®, Accredited Financial Counselor designation, in January 2004. She is a member of the Association for Financial Counseling and Planning Education and the Financial Planning Association. Nancy has served on the board and investment committee of a private foundation since 1994. She helped develop the investment policy guidelines for the board, including the incorporation of social justice, women’s, and environmental issues in their financial management and decision-making. She managed two custodial accounts for 14 years and has assisted family members in various aspects of personal finance planning. Lauren Gjessing was raised in Cincinnati and is a current student at Antioch College. She studies political economy and is interested in resilient communities, food systems, and community engagement. She transferred from Ohio University. She has been involved with Antioch College’s student union, the school’s fossil fuel divestment initiative, and the Sustainability Committee. She has worked locally on the Antioch College farm and for the Tecumseh Land Trust and helped with educational outreach. Last winter she was an intern at the Land Institute in Kansas where she helped with agriculture research focused on long-term sustainability. Roger Wilkens, PhD, is the Executive Director of the Southeast Ohio Public Energy Council (SOPEC), which is the organizational vehicle for electric aggregation and an array of energy efficiency and renewable energy projects known as UnGrade Athens County (UAC). He is the founder and Executive Director of the Center for the Creation of Cooperation, which is currently focused the Green Schools Initiative under UAC and a Pilot Microgrid Project in conjunction with Ohio University. Roger is an educator with over 35 years experience working with various types of cooperatives, including worker, producer, consumer and renewable energy cooperatives. He was a co-founder and early co-director of the Appalachian Center for Economic Networks (ACEnet), where he helped provide cooperative training to some of Athens’ fine cooperatives, and directed ACEnet’s Flexible Manufacturing Networks project. He served as Director of River Valley Community School and Director of the Dogwood Center for Self Development. 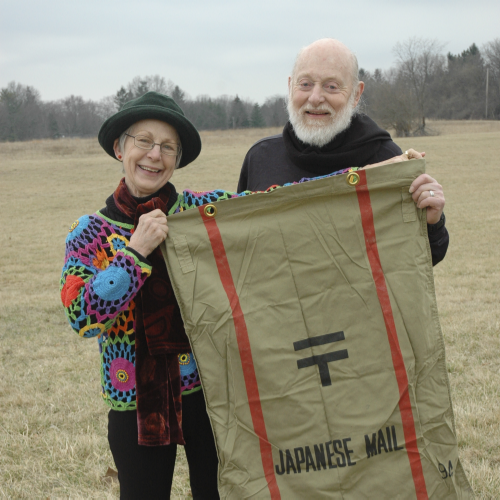 Jonatha and Harold Wright specialize in Ohio, Ohio Appalachian and Japanese stories, performing both solo and in tandem. Their ties to Japan stem from Harold’s career as Professor of Japanese Language and Culture at Antioch College, and the 14 years when they led college student study exchange semesters between Antioch and Kyoto Seika University. These careers provided the major sources for their Japanese stories. Their books, “Spine Tingling Tales of Old Japan” and “Flesh Crawling Tales of Old Japan includes many of their favorites. The Wrights gathered stories and Oral Histories from elders in Ohio’s Appalachian counties through an OAC grant to the Appalachian Highlands Storytelling Coalition’s Project Save Our Stories. They have taught storytelling at several Ohio Colleges including Antioch College, Antioch University Midwest and Sinclair College. Harold Wright will be performing Saturday September 26th.